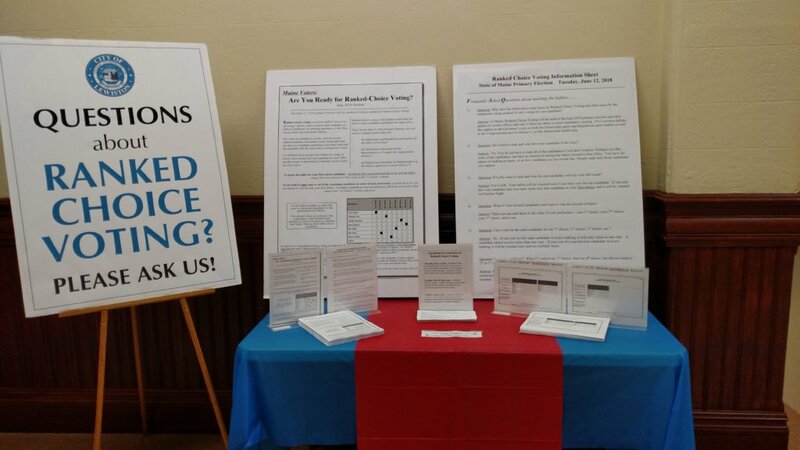 LEWISTON — The City Clerk’s office has put together an informational kiosk on ranked-choice voting at City Hall in preparation for the June 12 primary. According to a news release Wednesday, the clerk’s office has created a voter information table on the second floor of City Hall with materials regarding ranked-choice voting. Maine will be the first state to use the system. The handouts include copies of sample ballots for the June 12 state primary election for the Democratic and Republican parties, and basic information from the Maine Secretary of State about ranked-choice voting. There is also a list of frequently asked questions about the new system. “This is part of the city’s ongoing voter education program to inform the residents about their voting options for the June 12 election” City Clerk Kathy Montejo said. She said a televised presentation was made during this week’s City Council meeting and handouts were distributed at the polls during last week’s school budget referendum. Additional information is available on the city’s website, she said. The system was first supported by referendum in November 2016, but has faced legal challenges, including earlier this month when the Maine Republican Party filed a federal lawsuit to halt its use in the June primary. The move came after the Maine Supreme Judicial Court issued a ruling in April ordering that ranked-choice voting be used in the June primary. In the ranked-choice system, voters rank candidates in order of preference. If after the first count no one wins a majority, the candidate with the fewest votes is eliminated. Voters who chose the eliminated candidate would have their ballots added to the totals of their second-ranked candidates, and the ballots would be re-tabulated. The process continues until one candidate has a majority. The information campaign for ranked-choice is continuing up until the election next month, along with a number of events. In the run-up to the election, Maine Secretary of State Matt Dunlap will make four stops across the state to provide information to voters, including Tuesday, May 29, at the Lewiston Public Library from 4 to 6 p.m.
Dunlap is offering a presentation and question-and-answer session via Facebook Live on Thursday, May 24 at 6 p.m., on the Maine Department of the Secretary of State Facebook page. In addition, Montejo will make a presentation to the Lewiston Senior Citizens organization at its monthly meeting June 4. Montejo said the voter information table at City Hall was created with older voters in mind. “We are aware that many of our residents do not use computers or the internet and therefore might be seeking sources of additional information to prepare for Maine’s first ranked-choice voting election,” she said. Voters who do have internet access are encouraged to visit the Maine Secretary of State’s ranked choice voting resource center website for more information. Tuesday, June 12, polls open from 7 a.m. – 8 p.m.
• All voting will take place at the regular polling locations. • Absentee ballots will be available soon. • Deadline to order absentee ballots is Thursday, June 7 by 7 p.m.
• Voters wishing to cast an absentee ballot may do so in person at the City Clerk’s Office, 2nd floor of City Hall. • Voters who would like to have an absentee ballot mailed to their home can call the City Clerk’s Office at 207-513-3124. Requests must be received before 7 p.m. on Thursday, June 7.